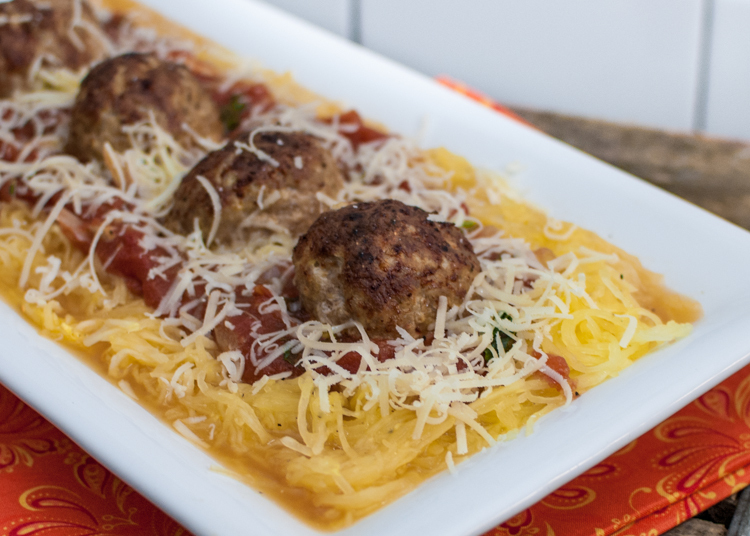 Spaghetti Squash and Turkey Meat Balls is an easy gluten free and healthy way to tackle a week night meal. As we are headed into the season of gluttony, Tiffany and I are trying to be a little proactive. We have a had a wonderful time this summer seeing, eating, and drinking. Moderation has never really been a strength of mine in the spirit of full disclosed it all or nothing baby! So that being said, my never fail fitness monitoring device called “my belt” gave me a reading of “I have no more notches left in me, so dude get back on the wagon”. So back on the wagon we are going which means regular exercise (OK), eating healthy (at least most of the time) and only a few glass of wine a week (that means only 2, dang it!!). 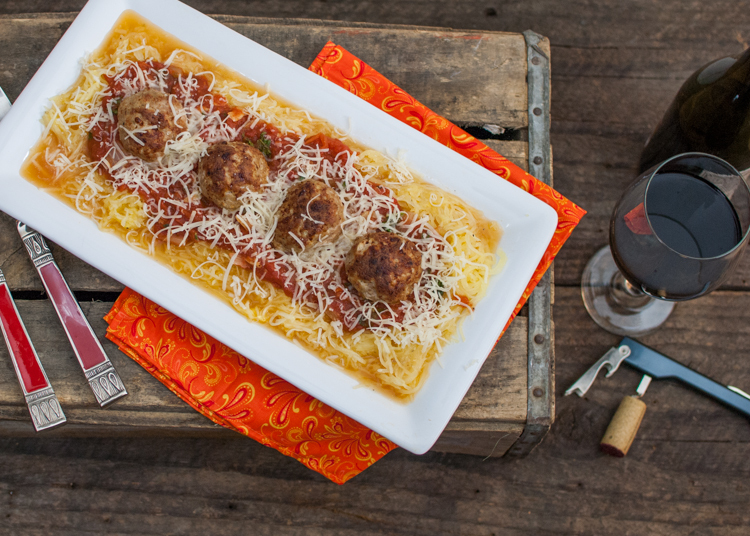 We came up with this dish primarily because it is gluten free, with a high comfort factor. I find with replacing the pasta with the squash this dish is total filling and satisfying with out the food coma after effect. I love roasting things in the oven just because I feel it’s just easy to throw it all in the oven. I just get every thing ready on a few 1/2 sheet pans and pop them into the oven all at once. I have to say you really don’t miss the pasta, the squash has a unique texture ( like spaghetti) and a rich squashy buttery flavor. Pre head oven to 425 degrees. 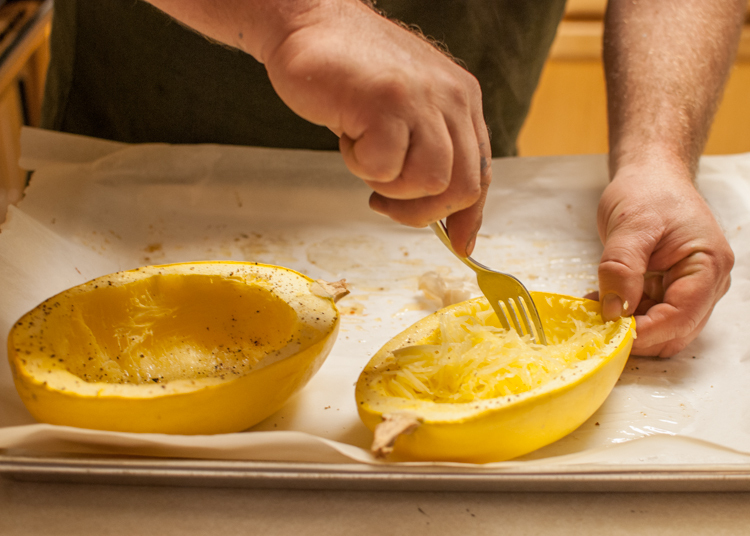 Cut spaghetti squash in half and scoop out seeds and place on sheet pan. Roast in oven for 35 minutes. Combine ground turkey, egg, gluten free bread crumbs and salt and pepper in a bowl. Roll meat balls into 1 1/2" spheres and place on parchment paper lined sheet pan. Roast in oven at 425 degrees for 15 minutes. Warm spaghetti sauce in a sauce pan. With a fork, shred flesh of spaghetti squash and combine with sauce. Place meat balls on top and eat!! Wow, amazing dish that I can imagine vegetarianizing the meatballs and being able to put on the table with Thanksgiving! Beautiful plating too. I can imagine vegetarianizing this recipe (the meatballs maybe switched out for mushrooms) for Thanksgiving, and hey great plating!